Easter is the perfect holiday to host your family and friends. when the first really warm weather is here and our garden puts on its first gorgeous show. for our family, and friends. fire pit, some with blankets, it was a little chilly! But that didn’t dampen our Easter fun, not one bit. then these entertaining tips are for you. At the door. Welcoming your guests at the door is the best way to show them how excited you are to see them! 2. OFFER A WELCOME DRINK. At times, I set up a little tray in the hallway with drinks. But for Easter, it’s a pot-luck, so the drinks station is outside in the back garden. If I can’t offer our guests a drink myself, I’ve usually asked John or one of our children to ask each guest if they would like a drink. It makes your guests feel comfortable, and included. 3. PLAY MUSIC. Louder than normal. A fun upbeat music selection, or a calming classical one, can set the tone for any party. Great music will have an immediate impact on your party and quickly get it off the ground. The more, the better. I plan out my table ahead of time, with platters and little sticky notes on each for what will go on that particular platter or in the serving dish. For our Easter Buffet, I make a place for the plates, the napkins and flatware, glasses, serving dishes and leave open spaces for the dishes our guests will be bringing. I set it all up the day before, so on Easter Sunday, it’s ready to go! 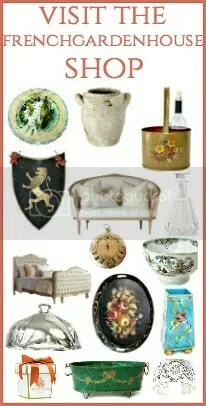 Don’t be afraid to mix in some of your favorite antiques or vintage pieces. This is a good time to have some fun! 5. ADD SEASONAL DECORATIONS TO YOUR TABLE. Try not to overdo. A gorgeous floral bouquet, a few scattered eggs, and a bunny is wonderful! Keep it simple. Fresh flowers are a dazzling way to add festivity to your table and create cheerful setting for your party. Some years, I arrange pastel spring flowers “just so”, but other years, I might just place a big bunch of flowers in every color in an antique French jar like the one below. 6. KEEP YOUR MENU SIMPLE. We host our Easter lunch each year. It doesn’t matter how many people come! My menu is the easiest…I order a ham and a turkey breast from Honey Baked Ham, buy drinks, make one appetizer, and let guest bring one side dish that their family loves. I always say this is the easiest party to have, e v e r. My part of the menu never changes, I don’t cook or bake anything. Easy but delicious recipes are the best. Make sure you have made it before so you know it will come out right. The Easter Brunch Check List post has some tried and true recipes that I can always count on. 7. LOVE THE LITTLE PEOPLE. I always pick up an assortment of coloring books, stickers, and other small crafty things for the kids to do. Even at Easter, since mean me makes them wait until after they have eaten lunch to go find the eggs and treasures with their little baskets in tow, they love to “create”. Bonus. Often, the other guests join in on the fun. It’s heartwarming to see a great-grandmother enjoy painting something just as much side by side with her great-grandchildren. Those are the moments I cherish about this whole entertaining thing! This one is close to my heart, as I love nothing more than to add beautifully planted flowers to our front porch entryway. I always have something new and fresh in the planters by my front door for a party. 9. HAPPY HOST HAPPY GUESTS. The most important thing you can do to make your guests feel welcomed and relaxed is to be relaxed yourself. With a little organization ahead of time and a simple easy to make menu, you will enjoy your party yourself, and have lots of time to spend time with your guests! I’ve just restocked some of your favorite spring and Easter entertaining staples. ARE YOU ENTERTAINING FOR EASTER? HOW DOES YOUR FAMILY CELEBRATE? If you want to romance your Home and Garden with antique and vintage treasures to make you smile each time you come home, visit our shop FrenchGardenHouse. I long for the days of Easter Egg Hunts and the Scavenger Hunt too….now the girls who used to come over for Easter along with their parents as guests of us and my granddaughter are all teenagers now…time passes too quickly…but I still enjoy having my family over….Love all of your beautiful Spring/Easter tables and the garden…and oh my that pillow! Happy Monday Lidy…thanks for the inspiration!! What a wonderful post, Lidy! All photos are so beautiful and your tips both useful and really, rather easy to implement so long as you plan! I don’t know what our Easter will be like this year. Rick will still be flat on his back from surgery. But we’ll do our best and maybe next year we’ll have a big do! Your Easter brunch in the garden is such a fun space, all the flowers and the greens. I have location envy we’re expecting a snow storm this week -yuck! Even tho easter is late no hope for us. Guess we’ll be inside. All your table decor is stunning as always! Thank you Denise! I have had my share of “inside” Easters too, I hope it all thaws out soon, and that gorgeous spring arrives where you are. So beautiful and so many great tips as a reminder for those of us who love entertaining and haven’t done so in a little bit. Reminders are always a good thing! I am swooning over the foxglove, I used to have a huge perennial garden in Ohio, but alas, I am still learning what I can grow or not here in Florida! This was a lovely way to begin Monday morning! Thank you so much, Chloe! Oh, please do entertain, even if it’s only one friend for a lemonade and a cookie in your beautiful Florida! We have to buy new foxgloves each year here in Southern California, too, unfortunately that “naturalizing” that they do in other parts of the garden doesn’t really happen here often. Wishing you a gorgeous week! Beautiful post and I love your menu suggestion… easy 🙂 Have a nice week! Thank you Theresa! It IS the easiest menu – it may be why it’s my favorite! !